Over 40% of British people suffer from some kind of allergy. The British Allergy Foundation describes Asthma as "the most common chronic childhood medical condition". 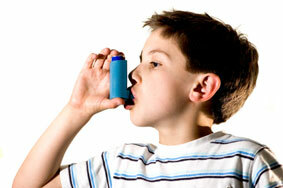 Asthma affects approximately 1 in 10 children and is on the increase. 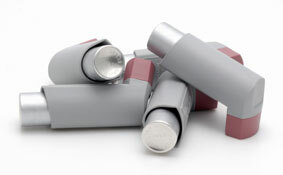 Every year, over 2,500 people in this country die from Asthma. 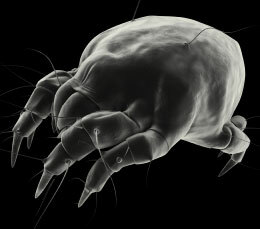 Dust mites are less than 0.3mm long and live in our beds, carpets and upholstery, eating flakes of our dead skin. They lay enough eggs to produce a new generation of mites every 3 to 4 weeks. The tiny faeces they produce, when we breathe them in, are the MAIN CAUSE of Asthma. The bodies of the mites have an unusually high water content, so they can only thrive in a humid environment. MYTH: You need to get rid of your carpets and have only wood floors, tiles or vinyl. FACT: With the correct treatment followed by deep cleaning, dust mites and their eggs (as well as their faeces) can be completely removed from carpets and rugs as well as upholstery. Controlling humidity also helps. MYTH: Expensive vacuum cleaners can remove dust mites and their faeces. FACT: Although some cleaners do a good job of removing the faeces, they cannot remove the eggs and will probably leave most of the mites themselves. These have to be killed by appropriate chemical treatment. Soft furnishings must first be treated with specially formulated chemicals which will kill the mites and their eggs, then deep cleaned using professional equipment. "The products used must be non-toxic to humans and friendly to asthma sufferers in particular". Dirtbusters are specialists in this procedure and can guarantee a mite-free environment almost immediately, with treatments lasting up to a year. If you are in London or the Northern Home Counties, please call Dirtbusters on 01279 833606 for more information.